MEXICO CITY, Mexico, August 3, 2016 (ENS) – Mexico is to permanently ban the use of gillnets in waters where the endangered vaquita is found, in an attempt to save from exinction this small porpoise found only in the Gulf of California, Mexico. Today, vaquita numbers are thought to have dropped to just 60 surviving individuals, according to the most recent report of the International Whaling Commission’s Scientific Committee. Vaquitas inhabit the northern part of the Gulf of California where gillnets are used to catch a species of fish, the totoaba, also at risk of extinction. The totoaba is highly prized in Asia, especially China, where its swim bladder can sell for several thousand dollars. The ban offers a chance to save both species but this can only be achieved with strict enforcement and monitoring to prevent illegal poaching. “Without action the vaquita will be gone – the second entirely preventable cetacean extinction we will have witnessed in the last 10 years,” warns the 2016 report of the IWC’s Scientific Committee. In April 2015, Mexico’s President Enrique Peña Nieto announced the temporary suspension of commerical fishing by using gillnets, falsework and / or longlines operated with small boats in the northern Gulf of California. But, this year the IWC Scientific Committee received new information about a dramatic escalation in the illegal fishing which has reduced the only vaquita population in the world by 92 percent in less than 20 years. A Chinese black market trade in the swim bladder of the totoaba fish drives illegal gillnet fisheries which catch totoaba and also trap vaquita. Despite enforcement action by the Mexican government, high demand has escalated fishing activity. The Scientific Committee repeated calls for a permanent gillnet ban and increased enforcement action, not just in Mexico but in all countries involved in the smuggling and trade of totoaba. Saying that the use of gillnets and longlines has been devastating to the biological diversity of the Gulf of California, often considered one of the most biologically diverse marine areas in the world, conservationists are also working to protect the ecosystem and the few remaining vaquitas. In February 2015, the Sea Shepherd Conservation Society launched Operation Milagro to investigate the plight of the vaquita porpoise and identify ways to intervene and protect the animals. Their vessel, the R/V Martin Sheen, remained in the Gulf of California until May 2015, documenting the use of gillnets – nets that indiscriminately catch any animal that swims into them – as well as building relationships with marine biologists and other non-governmental organizations. In April 2015, Mexican President Enrique Peña Nieto announced a two year ban on the use of all gillnets in the northern Gulf of California. Shortly thereafter, Sea Shepherd documented the first live vaquita since 2013 and began building a partnership with the Mexican government to protect the vaquita. In November 2015, Sea Shepherd launched Operation Milagro II. Sea Shepherd dispatched two vessels to remove illegal gillnets and longlines set to catch the totoaba, a fish similar in size to the vaquita. The totoaba are another critically endangered species targeted by poachers specifically to sell their swim bladders on the black markets in Hong Kong and China. Dubbed “aquatic cocaine,” totoaba swim bladders can sell for more than $20,000 per kilogram in China as a status symbol and for their alleged medicinal properties. Many of the bladders are smuggled through the United States. In addition to removing illegal fishing gear, Sea Shepherd Conservation Society used aerial drones to document and report poaching activities to the Mexican authorities. 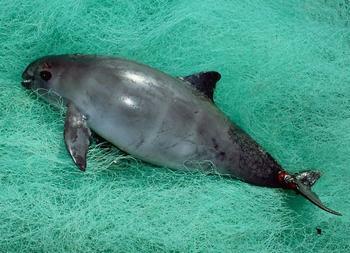 “It was amazing to spot three live vaquita during the course of Operation Milagro II. It gives me such hope that the vaquita can survive if appropriate measures continue to be taken,” said campaign leader Captain Oona Layolle. “We developed net retrieval devices that were so effective that we provided some to the Mexican Navy so that they too could seek out and remove these nets from deeper waters,” said Layolle. During the course of Operation Milagro II, Sea Shepherd removed 42 illegal gillnets and 16 longlines. The campaign saved one humpback whale, seven totoaba, fifty-five rays, dozens of sharks, and countless other marine animals that otherwise would have been caught. Yet, the illegal fishing gear claimed the lives of three vaquitas, dozens of sharks, a four meter long great white shark, as well as many totoabas, rays, and dolphins. “The partnership with the Mexican Government was productive and certainly made an impact in saving the lives of so many marine animals. We look forward to working more with the Mexican Government in the Gulf of California and other parts of Mexico,” said Layolle. Sea Shepherd plans to return to the Gulf of California in November 2016 to continue the fight against illegal fishing and to expand itsefforts to protect the vaquita.